Ann Bouchier-Hayes, from Dublin has been working as an artist since 1966. Having worked as a graphic artist for many years, she moved on to book illustrating and greeting card design. She is also known for her beautiful mosaics made from salvaged broken china and pottery. Now painting mostly in oils, her works include landscapes, flowers and especially still life in which she can evoke a feeling of tranquility with light and shade. Pearl Drew is a painter who lives in Ballybrack, Co. Dublin. 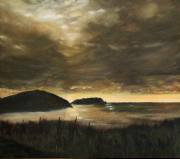 I paint from my studio at home and enjoy painting local and foreign land and seascapes. 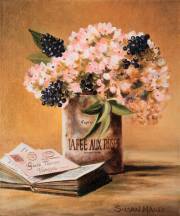 Still life and portraits are also favored themes. I work in oils and acrylics and have exhibited widely in Ireland and also enjoy making special commissions for people. Geraldine Granville, is primarily a landscape painter with occasional forays into the abstract. She has a bold sense of colour and structure and interesting brushwork. 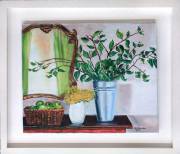 Her paintings come framed and unframed. Susan Magee, a very popular artist, lives and works in Dublin. She has exhibited in many exhibitions and venues, inspired by everyday life and the surrounding landscape, her paintings always seem to tell a story. She is currently studying with renowned artist Harrie McManus in the Arts Club where she has successfully exhibited her work over the years.